Haven't seen any progress lately? Don't worry. Get moving in the right direction again with these tips. Has the same number on the scale been popping up week after week? That's common. Being stuck at a weight-loss plateau eventually happens to most people trying to lose weight, despite continuing with the same exercise routine and healthy-eating habits. Reassess your habits. Look back at your food and activity records. Make sure you haven't loosened the rules, letting yourself get by with larger portions or less exercise. Cut more calories. Reduce your daily calorie intake by 200 calories — provided this doesn't put you below 1,200 calories. Fewer than 1,200 calories a day may not be enough to keep you from feeling hungry all the time, which increases your risk of overeating. In addition, this reduced calorie intake should be sustainable. If not, you'll regain the weight you've lost and more. Rev up your workout. Increase the amount of time you exercise by an additional 15 to 30 minutes. You might also try increasing the intensity of your exercise if you feel that's possible. Additional exercise will cause you to burn more calories. Consider adding resistance or muscle-building exercises. Increasing your muscle mass will help you burn more calories. Pack more activity into your day. Think outside the gym. 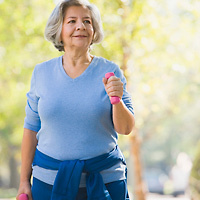 Increase your general physical activity throughout the day by walking more and using your car less, or try doing more yard work or vigorous spring cleaning. Focus on your weight-loss victories, and recognize that plateaus are just part of the journey. Continue your healthy eating and exercise habits, knowing that will help you sustain the success you've had.